This article is a breakdown on how to share vehicles between the different locations. In general, the system uses Vehicle Class to manage the availability of vehicles. Due to the nature of the system, each class is tied to a Company Brand. To learn more about vehicle class, click on this link here. Therefore, in order to actually restrict your vehicles to a certain location, you would first need to create the different locations as a company brand. To learn more about a company brand, follow this link here. However, if your company offers the luxury of transferring the vehicles from one location to another (if they’re presumably close by), the system can already handle that. This article is mainly to show a workaround to restrict the vehicles. Firstly, create a company brand. To do so, navigate to Settings > Fleet > Company Brands and click on the blue “Add Company Brand” button highlighted in orange in the picture below. You can also follow the link about the company brand above. Name the company brand as your location. Next, create the vehicle class and tie it to the company brand (location) that you created in Step 1. Navigate to Settings > Car Rental > Vehicle Classes and click on the blue “Add Vehicle Class” button highlighted in orange in the picture below. You can follow the link about the vehicle class above. 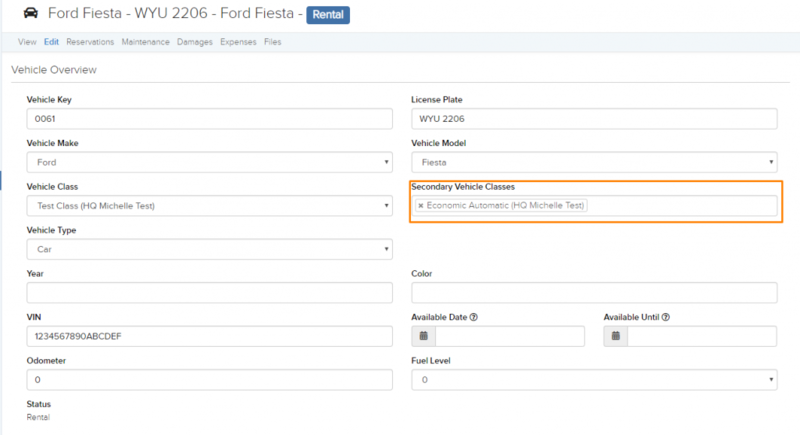 In this step, take note of the “Related Vehicle Class” field and select the class that it is related to. When you create the new company brand and vehicle class, you will have to do the rest of the items that the system requires to fully function. This includes Seasons, Rates, and Locations which you can click on the respective articles to learn more about. In this next step, navigate to Settings > Fleet > Maintenance. Here, set “Enable Vehicle Location?”, “Enable Multiple Classes per Vehicle”, and “Vehicle Class can be Changed if the Vehicle Has Reservations?” to “Yes” as shown in the picture below. In doing so, this will allow you to change the vehicle class of a particular vehicle to that of a different one and keep track of which location it is currently at. Now when you add a new vehicle, either by importing or adding one by one, you will notice the additional “Current Location” as shown in the picture below. This will help you to keep track at which Fleet Location this vehicle is currently located when selecting a vehicle for rental on Step 7 during the reservation process. An example, shown in the picture below. You will also notice a field called “Secondary Vehicle Class” as shown in the picture below, highlighted in orange. Now, whenever a particular vehicle is dropped off at a location, simply head to the vehicle and change the vehicle class to that of the vehicle class of the company brand (location).